A rather quiet month with only 258 birds ringed – our lowest October total for 10 years. Bedfont managed two sessions with a third rained off, but added Kingfisher. Elsewhere, top species was Lesser Redpoll at 65 followed by 20 Goldcrest, 17 Meadow Pipit, and 15 Redwing. There were recoveries of rapid Blackcap controls from both Cambridgeshire (after 9 days) and Derbyshire (after 10 days). But by far the most interesting recovery was a Redwing, ringed by RRG at Black Park CP in November last year and found, this month, near Sodankylä, Finland; 2,300km north-east and well north of the Arctic Circle. 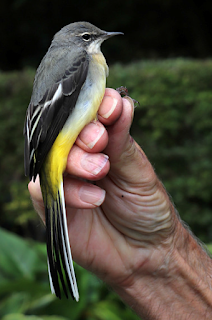 of the catch at 473, followed by Chiffchaff, nearly 18%, at 216. Highlights were a Grey Wagtail at Surrey (rarely caught at our sites), 50 House Martins at Wraysbury and 27 Willow Warblers. Other warblers tailed away with few after mid-month, but small numbers of finches spoke of things to come. improved later and are heading for reasonable totals. Overall, August saw 982 new birds ringed, rather more than 2017 (945) and well up on 2016 (764). The 34 species included: pulli of Barn Owl and Swallow and there were captures of Sparrowhawk, Jay, Magpie and three Jackdaw among larger species. Five House Martin and 13 Meadow Pipit came from Stanwellmoor and Willow Warbler were up to 56 after only 24 last year. Blackcap was top species at 299 followed by Whitethroat at 153 and Garden Warbler at 84. Reed Warbler had good numbers through Stanwellmoor raising them to 4th place at 71. A poor month for captures with a total of 482 new birds, when recent Julys have been over 700. Low catches continued on CES sessions and one of the three planned Wraysbury sessions was postponed till August, but whether the low numbers are due to the hot weather, or to a cold spring, or to low productivity, awaits analysis. The top species was Blackcap at 90, closely followed by Reed Warbler on 85. Only 20 Chiffchaff were ringed. Kingfishers have had a difficult year so it was good to have singles at Bedfont and Wraysbury, and Stanwellmoor had some success with all three hirundines. Other pleasing records this month were 3 juvenile Meadow Pipit at Stanwellmoor, 4 Cetti’s Warbler (Bedfont, Wraysbury and Stanwellmoor) and a House Sparrow at Bedfont South Side.